Expiry today was a dud, with Nifty in a very small range of just 33 points and not much of volatility. The index opened flat and stayed weak throughout the entire session of trade to close at 6034.75 a small loss of 21.00 points. On a month on month the index gained around 2.2%. The broader market remained weak, with 679 advances to 801 declines. 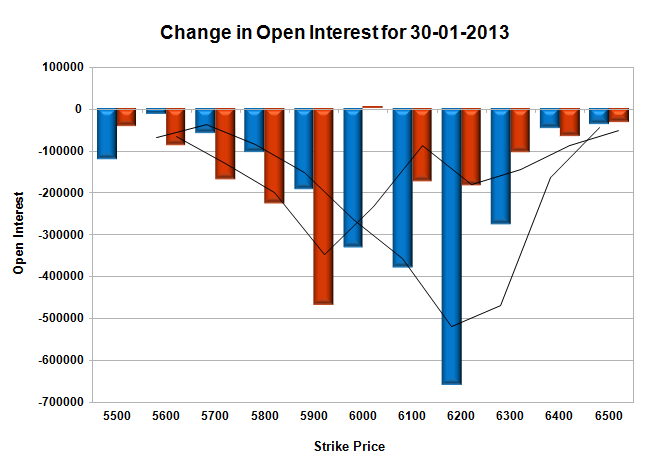 The OI Table at the start of series hints at resistance developing at 6200 level. 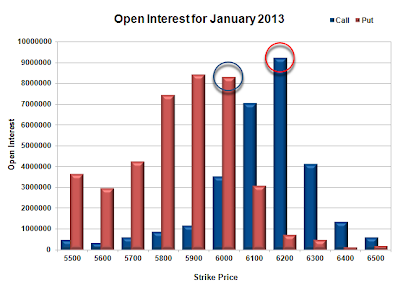 Call option 6000-6200, 6400 added 19.25 lacs huge amount of OI with small addition seen at lower strike prices. Put Option 6400-5500 added 45.37 lacs huge amount of OI. Highest accumulation on Call option 6200 at 43.2 lacs & 6100 at 31.7 lacs whereas Put option 6000 at 34.6 lacs & 5800 at 32.7 lacs. Nifty Open Interest is at 1,20,29,000 up by 29,04,700, mostly rollover with small decrease in price, most probably huge short build-up. Bank Nifty Open Interest is at 10,51,475, up by 2,98,325, mostly rollover with decrease in price, most probably huge short build-up. FII’s sold huge 8.20 lacs of Futures, most probably long liquidation, as their net OI decreased by 113531 contract and the average price per contract comes to around 6102. FII’s future open contract as on date is 236419. PCR Open Interest (Volume) at start of series is just above 1 at 1.010. 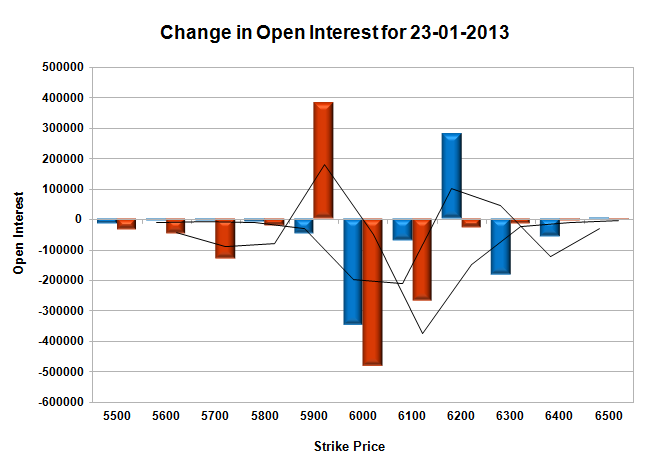 Support building up at 6000PE, with OI above 34.6 lacs and below that at 5800 with OI of 32.7 lacs. 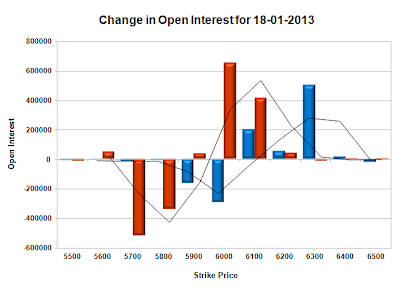 Initial resistance at 6100CE, with OI above 31.7 lacs, and above that at 6200 with highest OI in Option Table at 43.2 lacs. Range as per Option Table is 5999 - 6078 and as per VIX is 5990 - 6079 with 6045 as the Pivot. Nifty opened flat to positive, and traded within a very narrow range of 28 points for the entire session, with dips being bought into. The index ultimately closed the day flat at 6055.75 a small gain of just 5.85 points. The broader market was also weak, with 574 advances to 921 declines. The OI Table hints at either the CE writers at 6100 or the PE writers at 6000 will be tested on Expiry. 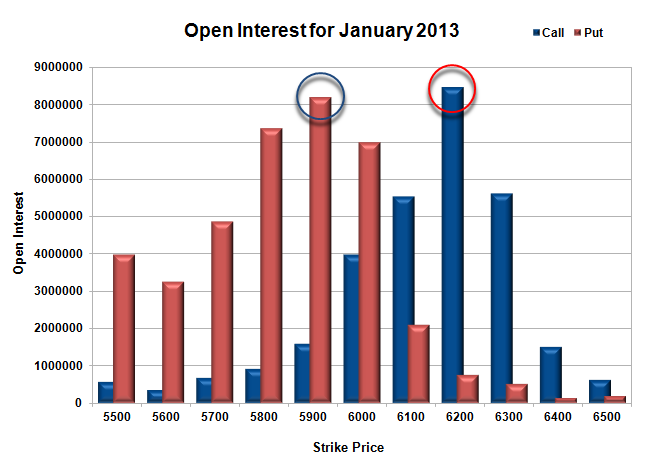 Call option 6000-5800 covered huge amount of OI with profit booking seen at 6100 and above strike prices. Put Option 6100 and above covered huge amount of OI with profit booking seen at 5900 and below strike prices. Highest accumulation on Call option 6200 at 1.22 crore & 6100 at 79.0 lacs whereas Put option 6000 at 83.2 lacs & 5900 at 77.9 lacs. Nifty Open Interest is at 88,50,950 down by 6,57,950, whereas Feb series added 16.26 lacs with small increase in price, most probably 100% rollover with huge long build-up. Bank Nifty Open Interest is at 7,29,325, down by 60,425, whereas Feb series added 2.4 lacs with increase in price, most probably 100% rollover with huge long build-up. FII’s bought huge 5.11 lacs of Futures, most probably long build-up, as their net OI increased by 44721 contract and the average price per contract comes to around 6057. FII’s future open contract as on date is 349950. 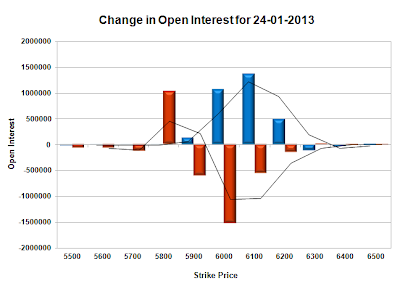 PCR Open Interest (Volume) is hovering around 1.285. 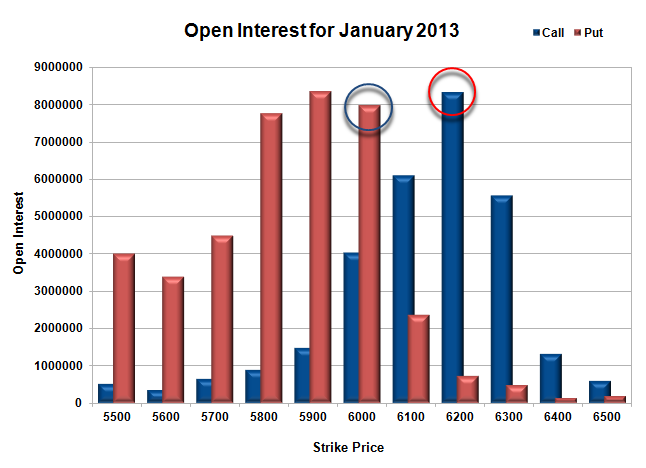 Support at 6000PE, with OI above 83.2 lacs and below that at 5900 with OI at 77.9 lacs. 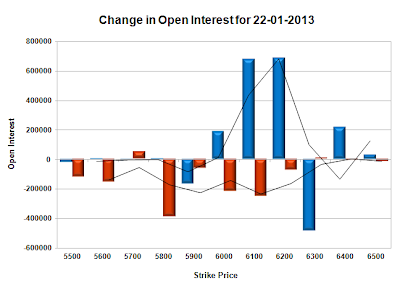 Resistance at 6100CE, with OI above 78.9 lacs, and above that at 6200 with highest OI in Option Table at 1.22 crore. 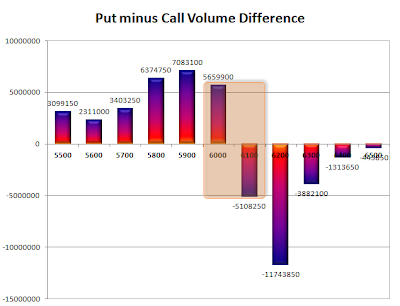 Range as per Option Table is 6018 - 6096 and as per VIX is 6010 - 6101 with 6055 as the Pivot. Nifty opened flat to negative, and moved up above 6100 on the back of positive monetary policy in the form of both Repo and CRR cut of 25 bps, but it seemed market participant were waiting to book out in a hurry, which saw the index close the day at 6049.90, a small loss of 24.90 points. The broader market was also disappointing, with 528 advances to 967 declines. The OI Table saw huge addition at 6100-6200CE level, with 6200CE OI above 1.28 crore. 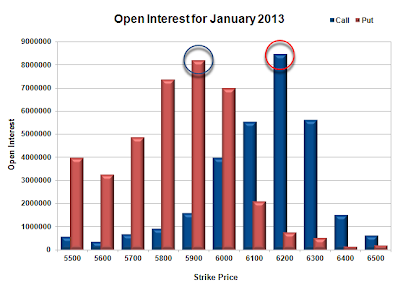 Call option 6100-6300 added 51.03 lacs huge amount of OI with huge short covering at 6000 and below strike prices. 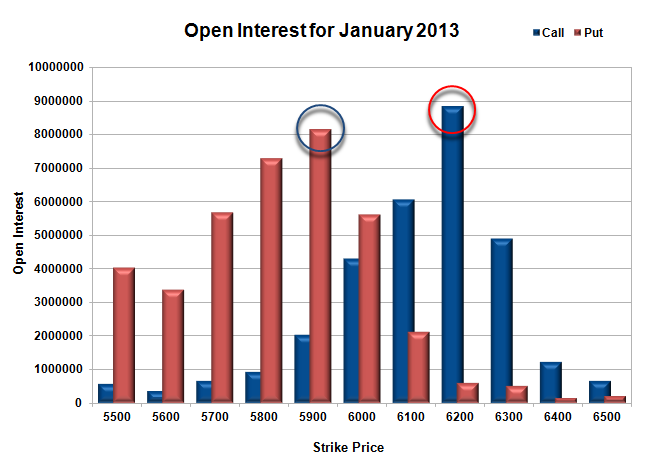 Put Option 5900 added 5.40 lacs huge amount of OI with huge short covering seen at 6000 and above strike prices. Highest accumulation on Call option 6200 at 1.28 crore & 6100 at 82.8 lacs whereas Put option 6000 at 83.2 lacs & 5900 at 82.6 lacs. Nifty Open Interest is at 95,08,900 down by 13,66,100, whereas Feb series added 21.19 lacs with decrease in price, most probably 100% rollover with short build-up. Bank Nifty Open Interest is at 7,89,750, down by 1,46,750, whereas Feb series added 2.19 lacs with decrease in price, most probably 100% rollover with short build-up. FII’s bought huge 10.42 lacs of Futures, most probably long build-up, as their net OI increased by 43075 contract and the average price per contract comes to around 6032. FII’s future open contract as on date is 305229. 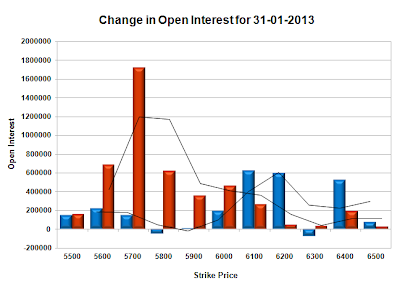 PCR Open Interest (Volume) has gone down to 1.234 due to huge addition at 6100-6200CE levels. 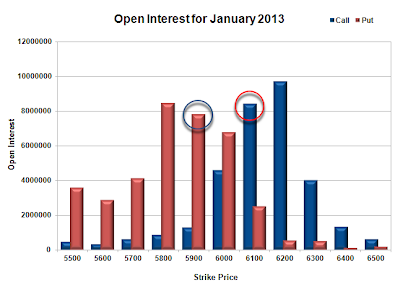 Support still very much at 6000PE, though covered a few for the day and below that at 5900 with OI above 82.6 lacs. Huge Resistance right now at 6100CE, with OI above 82.8 lacs, and above that at 6200 with highest OI in Option Table at 1.28 crore. Range as per Option Table is 6023 - 6104 and as per VIX is 6004 - 6096 with 6055 as the Pivot. Nifty opened flat, and after a small dip it was one way drive towards the highs of the day around 6080. The index ultimately settled at 6074.65, a good gain of 55.30 points. On a week on week basis the index gained 0.2%, the highest weekly closing in more than 2 yrs. The broader market also was good, with 925 advances to 585 declines. The OI Table saw a complete turn-around with PE writers back in business with huge addition at 6000-6100 levels. 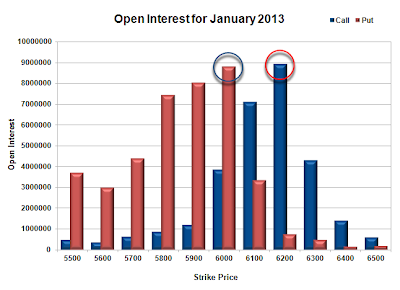 Call option 6400 added 0.95 lacs huge amount of OI with huge short covering at 6100 and below strike prices. Put Option 6100-6000 added 24.15 lacs huge amount of OI with profit booking seen at 5800 and below strike prices. Highest accumulation on Call option 6200 at 95.0 lacs & 6100 at 67.1 lacs whereas Put option 6000 at 85.6 lacs & 5800 at 80.9 lacs. Nifty Open Interest is at 1,15,66,450 down by 7,26,050, whereas Feb series added 11.66 lacs with increase in price, most probably 100% rollover with huge long build-up. Bank Nifty Open Interest is at 10,17,150, up by 59,450, whereas Feb series added 34,500 with increase in price, most probably long build-up. FII’s sold 4.79 lacs of Futures, most probably short build-up, as their net OI increased by 24218 contract and the average price per contract comes to around 6039. FII’s future open contract as on date is 262154. 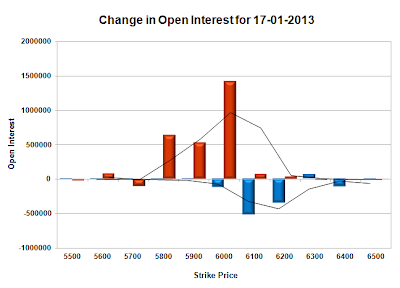 PCR Open Interest (Volume) is back to 1.429. 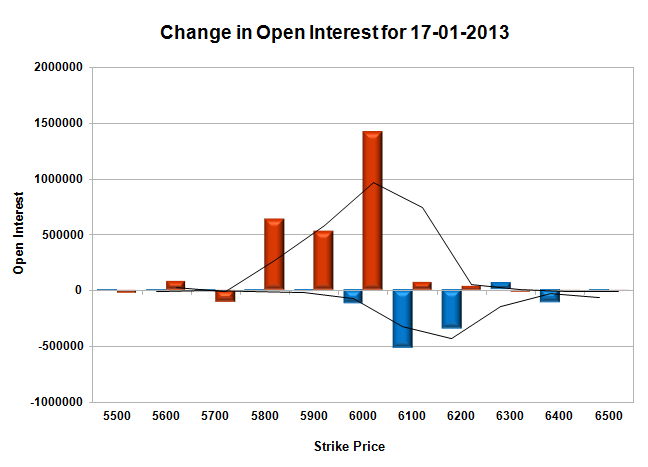 Support back at 6000PE with huge addition for the day at 17.7 lacs and below that at 5900 with OI above 78.1 lacs. 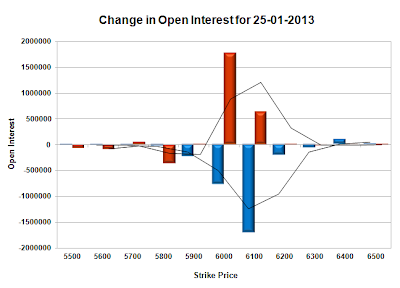 Small Resistance at 6100CE, with OI of 67.1 lacs, and above that at 6200 with highest OI of 95.0 lacs. Range as per Option Table is 6020 - 6102 and as per VIX is 6028 - 6122 with 6065 as the Pivot. Nifty opened flat to negative, and was sold off immediately to the lows of the day around 6010. Some buying was seen around that level, but it was not enough and the index closed near the lows of the day at 6019.35, a loss of 34.95 points. The broader market was weaker, with just 270 advances to 1264 declines. The OI Table saw huge un-winding at 5900-6100PE levels. Call option 5900-6200 added 30.71 lacs huge amount of OI with small profit booking seen at 6300 and above strike prices. Put Option 5800 added 10.37 lacs huge amount of OI with huge short covering seen at 6000 and above strike prices. Highest accumulation on Call option 6200 at 97.1 lacs & 6100 at 84.1 lacs whereas Put option 5800 at 84.6 lacs & 5900 at 78.0 lacs. Nifty Open Interest is at 1,22,92,500 down by 9,31,250, whereas Feb series added 4.11 lacs with decrease in price, most probably small rollover with huge long liquidation. Bank Nifty Open Interest is at 9,57,700, up by 1,150, whereas Feb series added 23,575 with decrease in price, most probably short build-up. 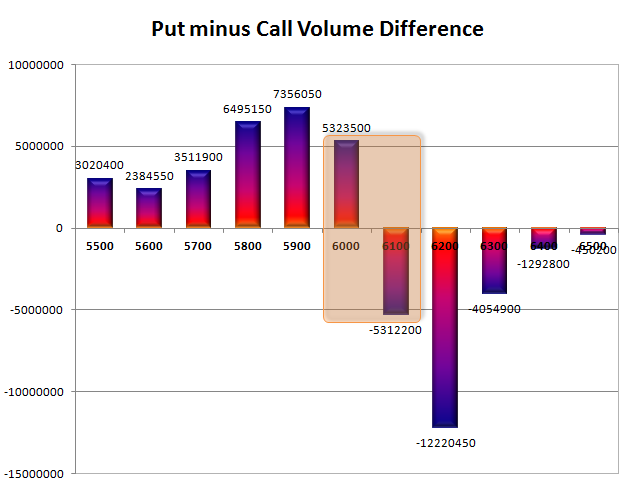 PCR Open Interest (Volume) has come down with huge liquidation at most PE levels and now at 1.249. Support at 6000PE looks very weak due to huge liquidation of 15.2 lacs for the day and below that at 5900 with OI above 78 lacs. Resistance just got bigger at 6100CE, with huge addition of 13.7 lacs for the day, and above that at 6200 with highest OI of 97.1 lacs. Range as per Option Table is 5986 - 6068 and as per VIX is 5974 - 6065 with 6035 as the Pivot. Nifty opened flat to positive, and traded within a small range for the first half. The index saw a dip towards 6020 level, where the responsive buyers took control to move the index above the previous day’s close to 6054.30 a smallish gain of 5.80 points. Again the broader market was very weak with just 419 advances to 1101 declines. 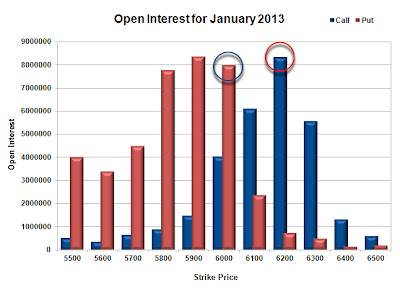 The OI Table saw huge profit booking in both CE and PE levels with not much of an addition. Call option 6200 added 2.78 lacs huge amount of OI with short covering seen at 6000 and below strike price. 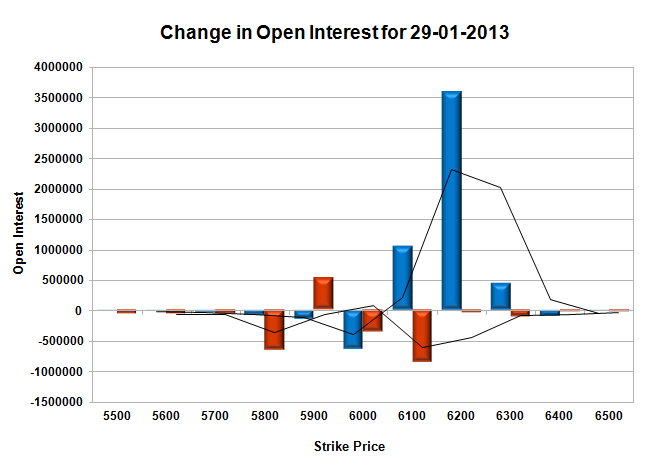 Put Option 5900 added 3.83 lacs huge amount of OI with short covering seen at 6100 and above strike prices. Highest accumulation on Call option 6200 at 92.2 lacs & 6100 at 70.4 lacs whereas Put option 5900 at 84.1 lacs & 6000 at 83.1 lacs. Nifty Open Interest is at 1,32,23,750 down by 6,00,000, with small increase in price, most probably long liquidation. 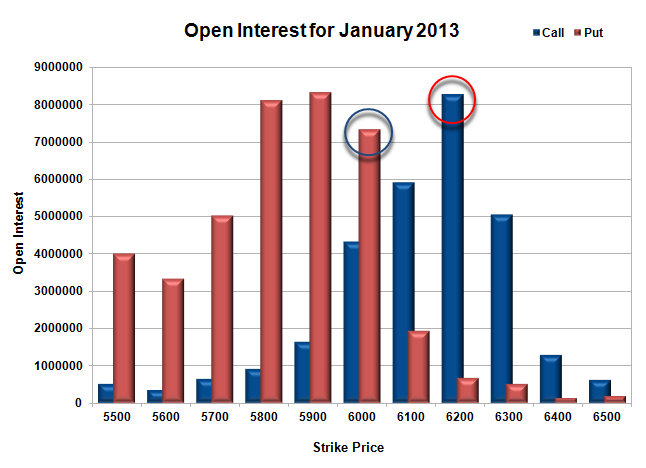 Bank Nifty Open Interest is at 9,56,550, down by 75,300, with increase in price, most probably short covering. FII’s sold 5.03 lacs of Futures, most probably long liquidation, as their net OI decreased by 2085 contract and the average price per contract comes to around 6045. FII’s future open contract as on date is 249301. PCR Open Interest (Volume) is at 1.424. 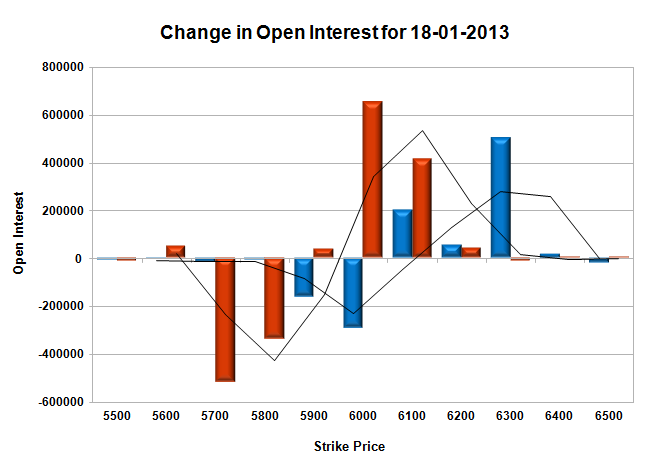 Support still at 6000PE with OI of 83.1 lacs and below that at 5900 with OI above 84 lacs. Resistance still at 6100CE, with huge OI of 70 lacs, and above that at 6200 with highest OI of 92.2 lacs. Range as per Option Table is 6009 - 6091 and as per VIX is 6011 - 6098 with 6060 as the Pivot. Nifty opened flat, and made a dash towards 6100 to see huge profit booking and the index hurtled down below 6050 to close around the lows of the day at 6048.50, a loss of 33.80 points. The broader market was also very weak with 424 advances to 1103 declines. The OI Table saw huge un-winding at most of the PE levels. Call option 6000-6200 added 15.58 lacs huge amount of OI with huge profit booking seen at 6300 strike price. 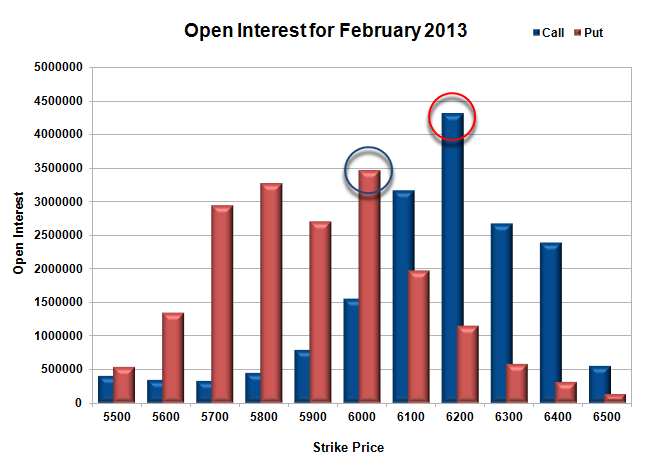 Not much addition seen at any Put strike with huge short covering seen at 6000 and above strike prices. 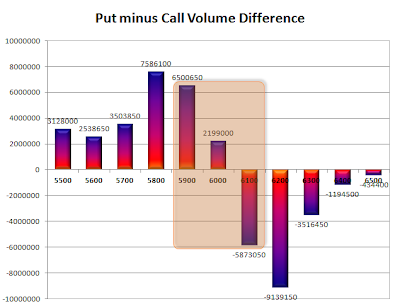 Highest accumulation on Call option 6200 at 89.4 lacs & 6100 at 71.1 lacs whereas Put option 6000 at 88.0 lacs & 5900 at 80.3 lacs. 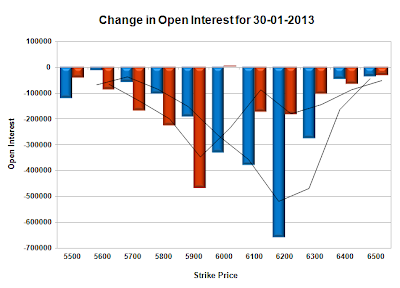 Nifty Open Interest is at 1,38,23,750 down by 8,92,350, with decrease in price, most probably long liquidation. 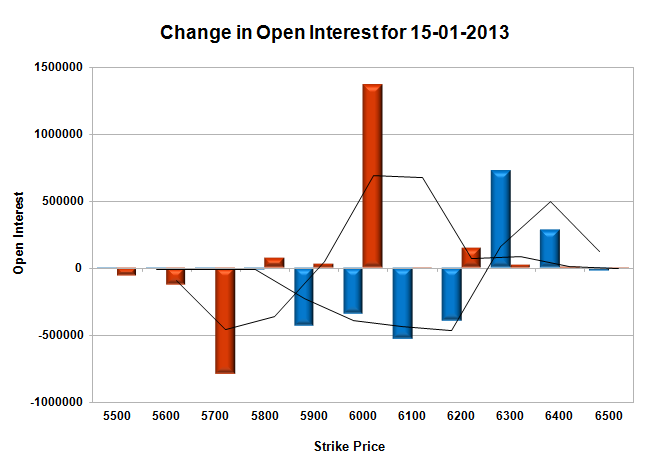 Bank Nifty Open Interest is at 10,31,850, up by 15,975, with decrease in price, most probably short build-up. FII’s sold 0.57 lacs of Futures, most probably long liquidation, as their net OI decreased by 3610 contract and the average price per contract comes to around 6035. FII’s future open contract as on date is 251386. PCR Open Interest (Volume) has gone down to 1.418. Support still very good at 6000PE with OI of 88 lacs and below that at 5900 with OI above 80.3 lacs. Resistance got better at 6100CE, with huge addition of 6.8 lacs for the day, and above that at 6200 with highest OI of 89.4 lacs. 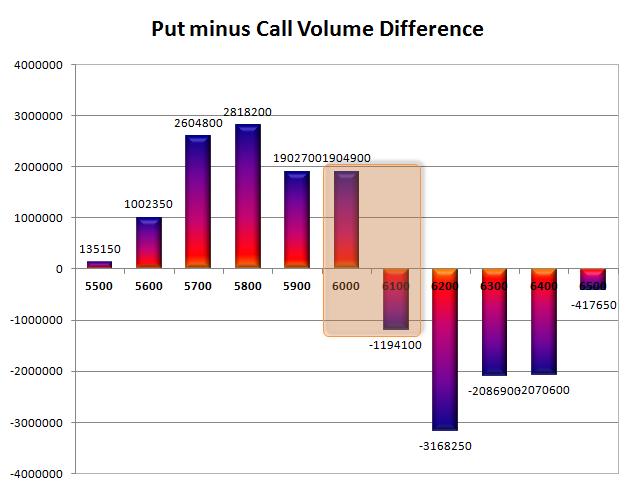 Range as per Option Table is 6019 - 6101 and as per VIX is 6005 - 6092 with 6055 as the Pivot. Nifty opened positive, and stayed in a very small range for the better part of the day, with a break-out seen towards the end of the day to move the index just a few points away from 6100. The index for the day closed at 6082.30, a small gain of 17.90 points. The broader market though is not going in tandem with Nifty, with 691 advances to 822 declines. 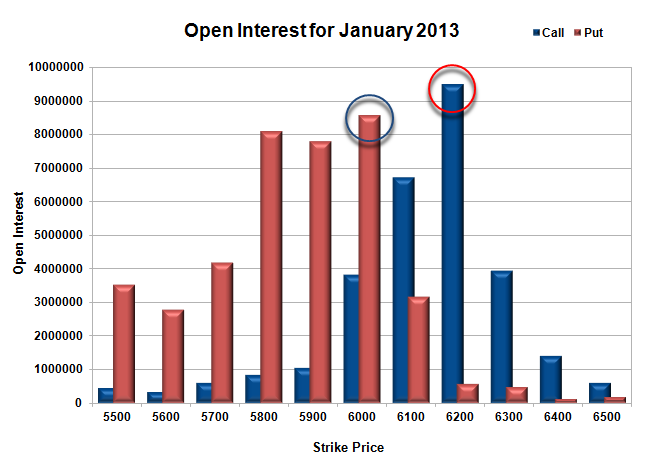 The OI Table saw 6000PE open interest above 90 lacs for the first time in the series and now is a base till expiry. 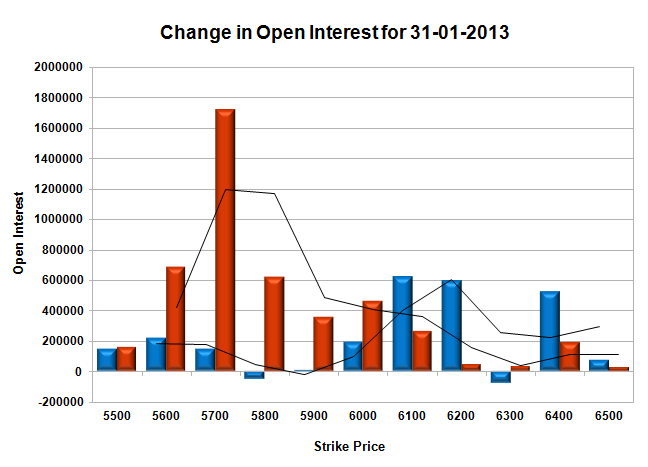 Call option 6100 added 3.31 lacs huge amount of OI with huge short covering seen at 6000 and lower strike prices. Put Option 6200-6000 added 23.90 lacs huge amount of OI with huge profit booking seen at 5900 and below strike prices. Highest accumulation on Call option 6200 at 82.5 lacs & 6100 at 64.3 lacs whereas Put option 6000 at 90.2 lacs & 5900 at 80.9 lacs. 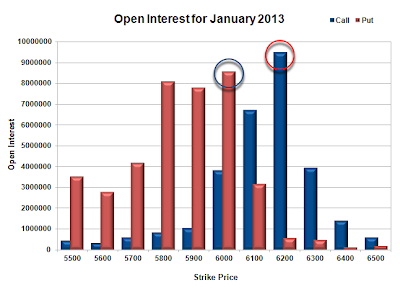 Nifty Open Interest is at 1,47,16,100 up by 1,55,800, with increase in price, most probably long build-up. Bank Nifty Open Interest is at 10,15,875, up by 65,250, with small decrease in price, most probably short build-up. FII’s sold 1.37 lacs of Futures, most probably short build-up, as their net OI increased by 6426 contract and the average price per contract comes to around 6066. FII’s future open contract as on date is 254996. 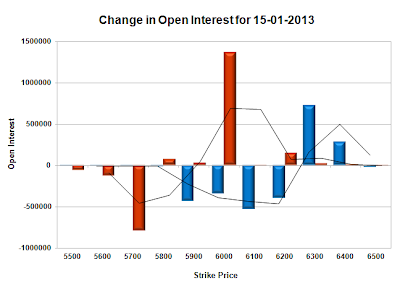 PCR Open Interest (Volume) has moved above 1.5 and now at 1.510 due to huge addition at 6100-6000PE level. Concrete Support now at 6000PE with highest OI of 90.2 lacs and below that at 5900 with OI above 80.9 lacs. 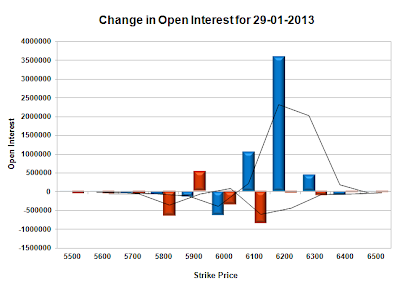 Resistance still at 6100CE, but may not hold, and above that at 6200 with huge OI of 82.5 lacs. Range as per Option Table is 6040 - 6122 and as per VIX is 6039 - 6126 with 6065 as the Pivot. Nifty opened positive, and went on to touch new highs for the month around 6085, but profit booking saw the index close at 6064.40 still a good gain of 25.20. The broader market though performed badly, with 592 advances to 922 declines. The OI Table saw huge support building up around 6000PE level. 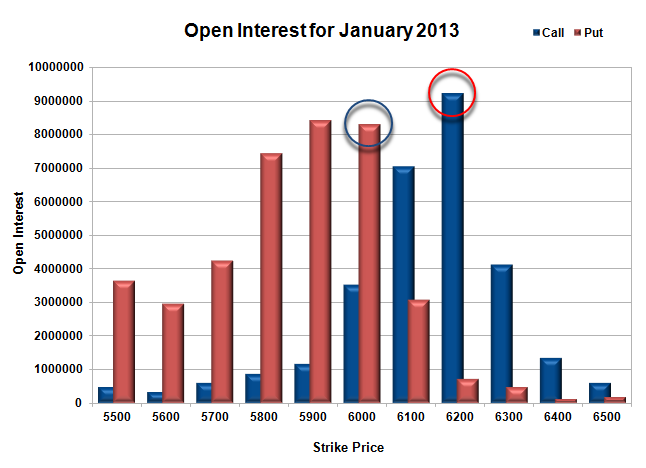 Call option 6100-6300 added 7.61 lacs huge amount of OI with huge short covering seen at 6000 and lower strike prices. Put Option 6100-5900 added 11.07 lacs huge amount of OI with huge profit booking seen at 5800 and below strike prices. 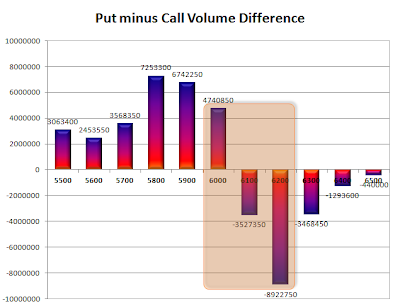 Highest accumulation on Call option 6200 at 83.2 lacs & 6100 at 61.0 lacs whereas Put option 5900 at 83.7 lacs & 6000 at 79.8 lacs. Nifty Open Interest is at 1,45,60,300 up by 16,050, with increase in price, most probably small long build-up. 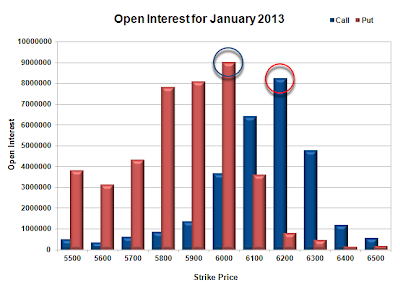 Bank Nifty Open Interest is at 9,50,625 down by 15,750, with small increase in price, most probably short covering. FII’s bought 3.71 lacs of Futures, most probably long build-up, as their net OI increased by 8917 contract and the average price per contract comes to around 6047. FII’s future open contract as on date is 248570. PCR Open Interest (Volume) is at 1.408. Support getting better at 6000PE with OI now above 79.8 lacs and below that at 5900 with highest OI of 83.7 lacs. Resistance still at 6100CE, but looking vulnerable with OI just at 61 lacs, and above that at 6200 with huge OI of 83.2 lacs. Range as per Option Table is 6022 - 6107 and as per VIX is 6020 - 6108 with 6050 as the Pivot. Nifty opened flat, but gained momentum on the upside with each passing hour to close strong at 6039.20 a good gain of 37.35. The broader market did not perform as well, with 681 advances to 825 declines. The OI Table saw a complete turnaround from yesterday with huge addition at 6000PE and liquidation seen throughout CE levels. 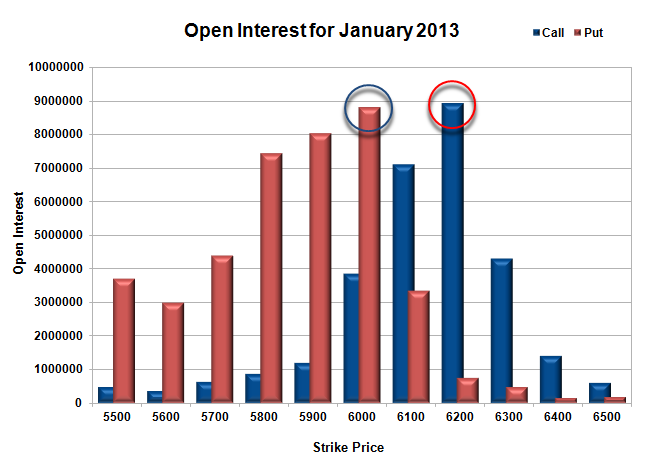 Call option 6300 added 0.61 lacs huge amount of OI with huge short covering seen at 6000 and lowere strike prices. Put Option 6100-5800 added 26.46 lacs huge amount of OI with small profit booking seen at 5700 and bolow strike prices. 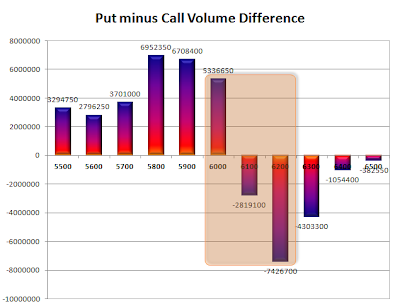 Highest accumulation on Call option 6200 at 82.7 lacs & 6100 at 59.0 lacs whereas Put option 5900 at 83.3 lacs & 5800 at 81.0 lacs. 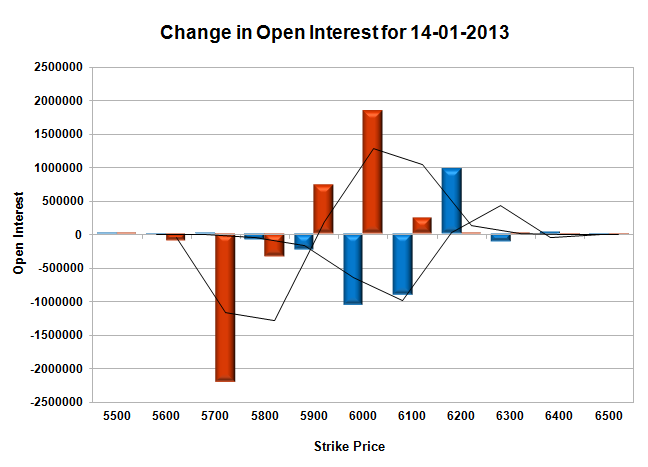 Nifty Open Interest is at 1,45,44,250 up by 13,050, with increase in price, most probably small long build-up. Bank Nifty Open Interest is at 9,66,375 down by 67,850, with small increase in price, most probably huge long liquidation. FII’s bought 1.27 lacs of Futures, most probably short covering, as their net OI decreased by 8822 contract and the average price per contract comes to around 6030. FII’s future open contract as on date is 239653. 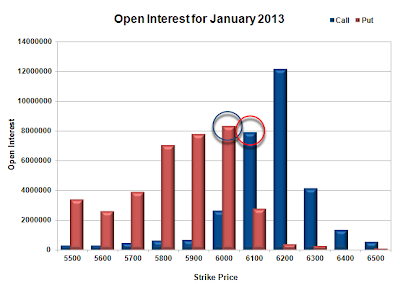 PCR Open Interest (Volume) is back to 1.409 due to huge liquidation seen at most CE strikes. Support got better at 6000PE with huge addition of 14.1 lacs for the day and below that at 5900 with highest OI of 83.3 lacs. Resistance still at 6100CE, though huge liquidation was seen, and above that at 6200 with huge OI of 82.7 lacs. Range as per Option Table is 5985 - 6074 and as per VIX is 5995 - 6083 with 6030 as the Pivot. Nifty opened flat, just below the previous day’s close and remained weak throughout the session going below 6000 spot but recovered just to close at 6001.85, still a huge loss of 54.75 points. The only saving grace was that the fall was basically due to long liquidation and not much shorts were added to the system. The broader market also performed miserably, with 328 advances to 1197 declines. The OI Table saw huge unwinding at 6000PE level. 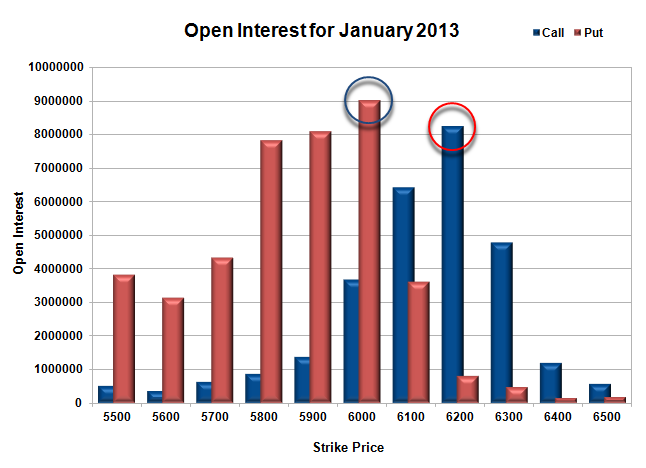 Call option 5900-6200 added 15.71 lacs huge amount of OI with profit booking seen at 6300 and above strike prices. Put Option 5800-5700 added 3.63 lacs huge amount of OI with huge short covering seen at 6000 and above strike prices. Highest accumulation on Call option 6200 at 86.1 lacs & 6100 at 64.2 lacs whereas Put option 5900 at 78 lacs & 5800 at 74.7 lacs. 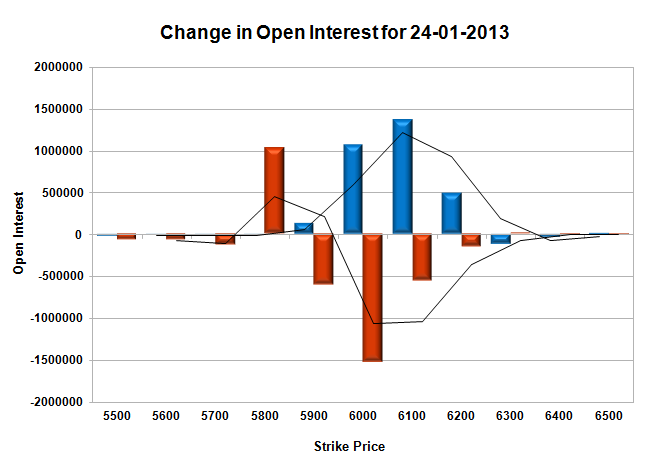 Nifty Open Interest is at 1,45,31,200 down by 9,71,200, with decrease in price, most probably huge long liquidation. Bank Nifty Open Interest is at 10,34,225 down by 1,51,725, with decrease in price, most probably huge long liquidation. FII’s sold 6.45 lacs of Futures, most probably long liquidation, as their net OI decreased by 4663 contract and the average price per contract comes to around 6010. FII’s future open contract as on date is 248475. 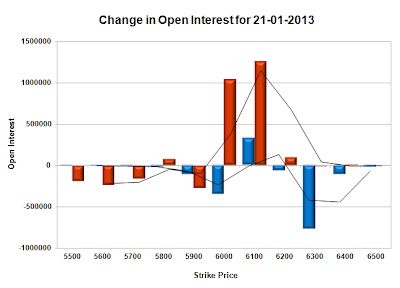 PCR Open Interest (Volume) crashed down to 1.287. Support at 6000PE looks vulnerable with huge liquidation of over 10.8 lacs for the day and below that at 5900 with OI of 78 lacs. 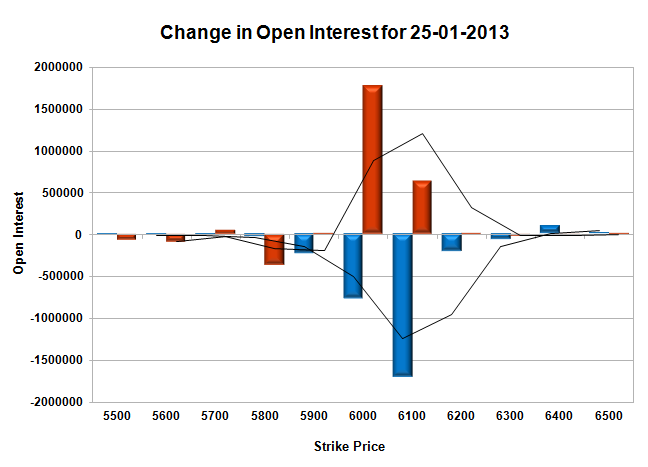 Resistance back at 6100CE, with huge OI of 64.2 lacs, and above that at 6200 with highest OI of 86.1 lacs. Range as per Option Table is 5968 - 6056 and as per VIX is 5958 - 6046 with 6010 as the Pivot. Nifty opened flat to positive and stayed in a narrow range for the better part of the first half, but saw huge buying when a dip came just below the previous day’s close to move to the highs around 6070, but closed just below at 6056.60, still a huge gain of 32.55 points. The broader market was flat, with 748 advances to 753 declines. 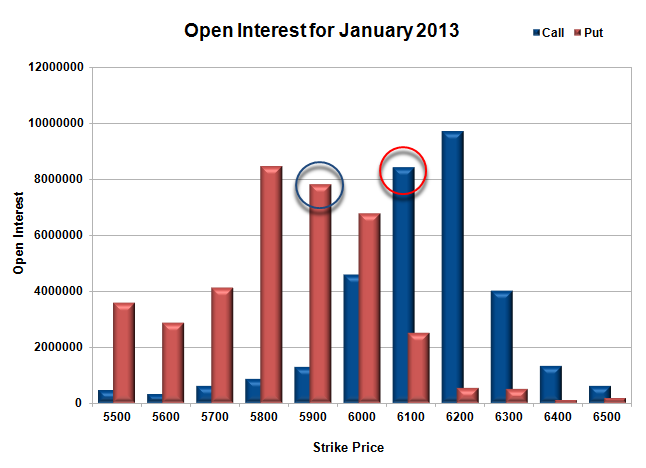 The OI Table saw huge addition at 6000PE, which is now turning out to be quite a good support. Call option 6300-6400 added 10.02 lacs huge amount of OI with huge short covering seen at 6100 and below strike prices. Put Option 6200, 6000-5800 added 16.18 lacs huge amount of OI with huge profit booking seen at 5700 and below strike prices. Highest accumulation on Call option 6200 at 84.6 lacs & 6300 at 56.1 lacs whereas Put option 5900 at 81.8 lacs & 5800 at 73.5 lacs. Nifty Open Interest is at 1,55,02,400 down by 4,36,450, with increase in price, most probably huge short covering. 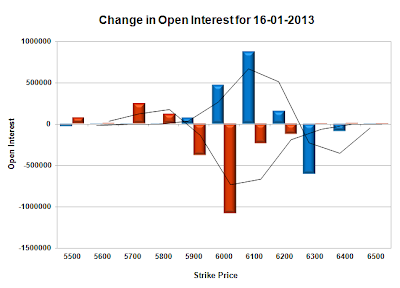 Bank Nifty Open Interest is at 11,85,950 up by 59,600, with increase in price, most probably huge long build-up. FII’s sold 1.63 lacs of Futures, most probably long liquidation, as their net OI decreased by 9254 contract and the average price per contract comes to around 6100. FII’s future open contract as on date is 253138. PCR Open Interest (Volume) is galloping and now at 1.359. Support at 6000PE with huge addition for the day at 13.6 lacs and below that at 5900 with OI of 81.8 lacs. Resistance at 6100CE, though got weak due to huge huge short covering, and above that at 6200 with huge OI of 84.6 lacs. Range as per Option Table is 6008 - 6093 and as per VIX is 6014 - 6100 with 6040 as the Pivot.